AQUALINK Home is a range of home water purification systems designed to treat and purify fresh water out of the public water network, regardless of its quality. The AquaLink Home perfectly suits the requirements of small, medium and large scale projects. AquaLink is used worldwide for domestic, industrial, private and public water supply applications. The AquaLink Home consists in a combination of scrubbers and membranes allowing deep filtration and removal of bacteria, viruses, amoebas and parasites responsible for diseases. The use of AquaLink Home ensures a safe drinking water whatever its conditions of production. Ultrafiltration is a filtering system by microporous membranes. These membranes are called “low pressure”, because of its transmembrane pressure that is around 0.2 to 2 bar. 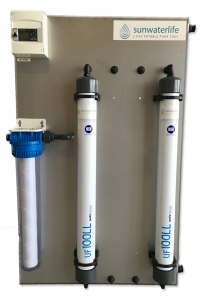 For drinking water, ultrafiltration is characterized by a cutoff threshold of the order of 0.01 microns. All larger molecules are stopped (pollen, algae, parasites, bacteria, viruses, germs and large organic molecules), letting at the end a perfectly clarified and disinfected water, without using chemicals. The membrane used in RO is a semipermeable membrane. It is composed of two filter layers. The principle is that water charged with salts, viruses, bacteria, organic matter … is injected through the membrane under high pressure, thanks to a pump. Under the effect of a difference of osmotic pressure, the water is filtered by the membrane, which make it drinkable. The impurities are rejected during this process by a sweeping flow.